Order Taifun Basil Tofu from the Online Health Food Store UK. 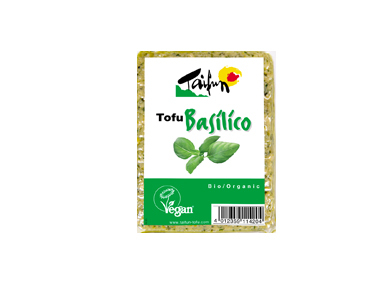 Buy Taifun Organic Vegan Basilico Tofu - 200g and other quality Meat Replacements safely online in the UK. This savoury basil flavoured tofu is commonly used in hot and cold Mediterranean dishes. Taifun Tofu Basilico is full of fresh herbs, accented with a subtle basil taste. This savoury basil flavour is commonly used in hot and cold Mediterranean dishes. Eat hot or cold. Ideal for vegans, vegetarians or for people who simply want to eat less meat! Dice or cut into slices. Excellent in a tomato salad. Tasty also with bread or enjoy it marinated as antipasti. Pan-fry as garnish for vegetable dishes. Tofu* 88% (SOYA BEANS* 55%, water, coagulating agents: magnesium chloride, calcium sulfate), olive oil extra virgin*, basil* 4,2%, vegetable broth* (sea salt, yeast extract*, potato starch*, sunflower oil*, leek*, carrots*, CELERY*, mace*, nutmeg*, parsley*), wild garlic*, parsley*. May contain traces of nuts, mustard, gluten and sesame seeds. and of course: Vegetarian and Vegan! Our UK Health Shop sells real Taifun and other Meat Replacements from top-quality brands safely online to customers throughout the United Kingdom in England, Wales, Scotland and Northern-Ireland. View more products on the Online Health Food Store from Taifun. Where to buy Taifun Basil Tofu safely online? Shop at the Online Health Food Store if you are wondering where you can buy Taifun Organic Vegan Basilico Tofu - 200g safely online in the United Kingdom. Our Health Shop is located in the UK and our award-winning independent has been serving customers in England, Wales, Scotland and Northern-Ireland since 1976. You can buy our Meat Replacements online and we post out orders to any UK address. Taifun Basil Tofu - Taifun Organic Vegan Basilico Tofu - 200g in Meat Replacements and Chilled Foods.